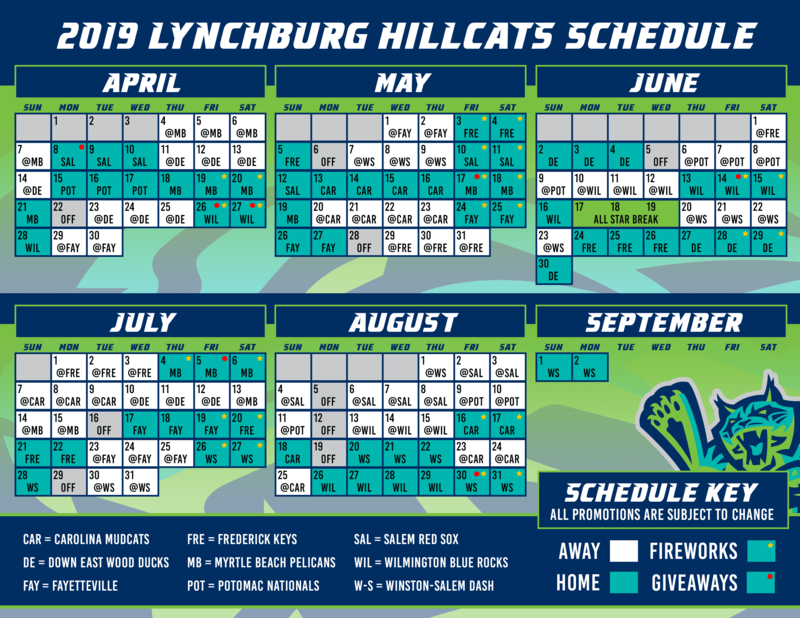 Woodbridge, Va. - The Lynchburg Hillcats split a de facto double-header in their postseason series with the Potomac Nationals on Saturday, winning the first game, resumed after being suspended on Friday, 6-4, and dropping the regularly-scheduled contest, 7-4. With the split, the Carolina League North Division Series is tied at 2-2, setting up a win-or-go-home scenario with the decisive game on Sunday. The contest picked up with one on and one out in the top of the sixth inning, with Potomac leading, 4-0. Taylor Guilbeau took over on the mound and issued an infield single to Dillon Persinger and hit Mitch Longo with a pitch to load the bases. Guilbeau got out of the jam after striking out Trenton Brooks . Lynchburg's offense woke up to plate five runs in the seventh. Gavin Collins and Anthony Miller hit back-to-back singles, and Jose Medina walked to load the bases. After Austen Wade struck out, Alexis Pantoja ripped a two-run single to trim the deficit to 4-2. 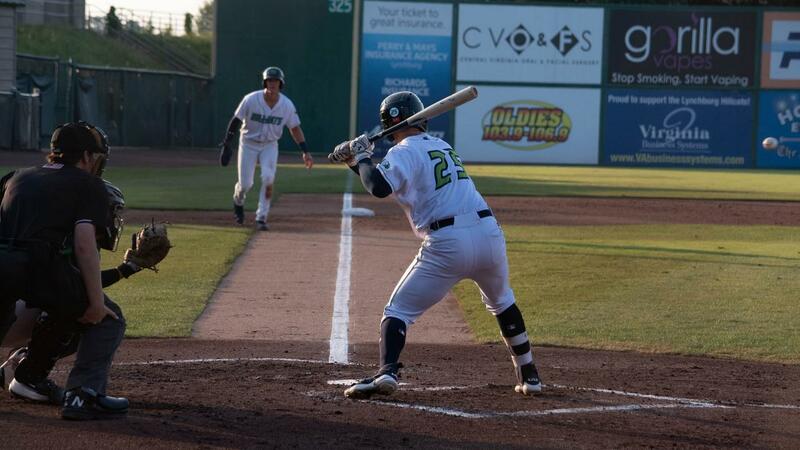 The next hitter, Persinger, blasted a go-ahead three-run home run to give the Hillcats a 5-4 lead. In the eighth, Lynchburg added a huge insurance run when Collins crushed a solo home run, capping the scoring at 6-4. The Nationals opened the scoring with two runs in the second. Tres Barrera led off the frame with an infield single and advanced to second on a ground out. Andruw Monansterio then singled to left and advanced to second on the throw back into the infield, putting runners at second and third. Nick Banks then came through with a two-run single into right field, to give the P-Nats the early 2-0 lead. Potomac added to their advantage in the fourth against Tanner Tully with another two-run frame. Aldrem Corredor singled up the middle with one out, and moved to second on a ground out. Banks then came through again with a run-scoring single to make it 3-0. Rhett Wiseman then followed with an RBI single to left to put the Nationals up 4-0. Tully logged five innings, allowing four earned runs on six hits. Micah Miniard (Win, 1-0) fired 1.2 scoreless frames and Jared Robinson (Save, 1) pitched 2.1 scoreless innings, striking out four. Kyle Johnston was sharp on the hill for Potomac. The righty fired 5.1 innings, giving up just two hits and a walk, while striking out three. He retired the first eight hitters he faced, and was just two over the minimum when the game was suspended. Guilbeau surrendered four earned runs on four hits in one inning, while Steven Fuentes (Loss, 0-1) allowed two earned runs, which proved to be the winning runs, in 1.2 frames. Lynchburg dropped a back-and-fourth battle in Game Four, 7-4. Potomac broke a 4-4 tie in the bottom of the eighth inning. Andruw Monasterio reached on a two-base error committed by shortstop Alexis Pantoja to start the inning. Luis Jimenez (Loss, 0-1) issued walks to both Nick Banks and Jack Sundberg to load the bases. Jimenez followed by hitting Jakson Reetz with a pitch to bring home a run. Later in the frame, Luis Garcia ripped a two-run single, putting the P-Nats ahead, 7-4. Down 3-0 in the seventh inning, Lynchburg used a walk, error and hit batter to load the bases. Austen Wade then crushed a grand slam to put Lynchburg ahead 4-3. The lead was short-lived, however, after Ian Sagdal hit a two-out RBI single for the P-Nats to even the score at 4-4. Potomac opened the scoring in the second inning when Monasterio hit a solo home run. In the sixth, Sagdal worked a two-out walk, and Aldrem Corredor ripped an RBI triple off the center field fence for a 2-0 lead. Later in the frame, Nick Banks grooved an RBI single to give Potomac a 3-0 edge. Kirk McCarty tossed 5.2 innings, allowing three earned runs on four hits. Adam Scott allowed a run in 1.1 innings and Jimenez allowed three unearned runs in the eighth. Nick Raquet started for the P-Nats, logging 6.1 innings and giving up three runs (two earned) He matched a career-high with eight strikeouts. Jacob Condra-Bogan (Win, 1-0) picked up the last five outs, working 1.2 innings and striking out the side in the ninth to shut the door. The winner take all Game Five is scheduled for Sunday afternoon, with first pitch at 1:05 p.m. Right-hander Eli Morgan (7-7, 3.91) will start for Lynchburg, against P-Nats righty Jackson Tetreault (1-1, 4.37). The winner of Sunday's contest will take on the Buies Creek Astros in the Carolina League Mills Cup Championship Series. Max Gun and Matt Present will be on the air with the pregame show beginning at 12: 55 p.m. on TuneIn Radio and Radio434.